From the sentimental items to the just-in-case items, professional organizer Christina Cortes breaks down the categories that our clothing items fall into to help you make your closet best serve you. As part of our closet resolutions series, we devoted a day to clearing out the clutter from Ashby’s closet and dresser with help from Professional Organizer Christina Cortes of Joyspace. 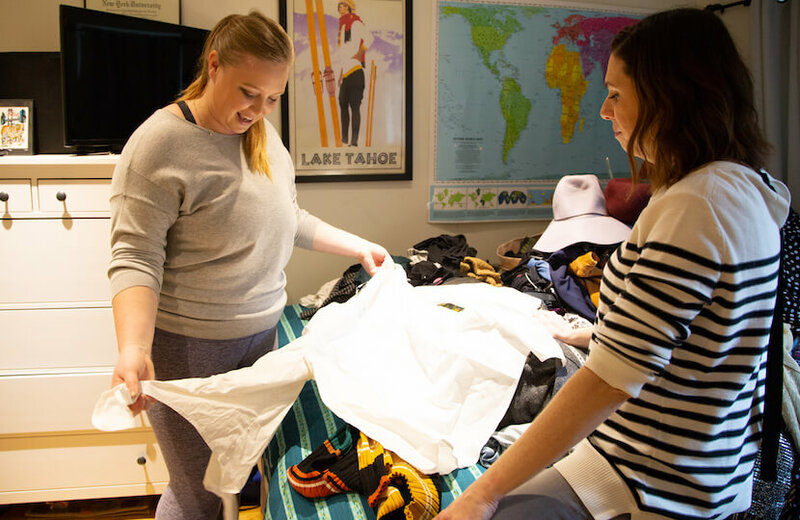 You can check out the final result from Facebook Live, see the entire process on YouTube, and learn some tips from Christina on how to fold and store your clothing KonMari style, created by tidying expert and best-selling author Marie Kondo. 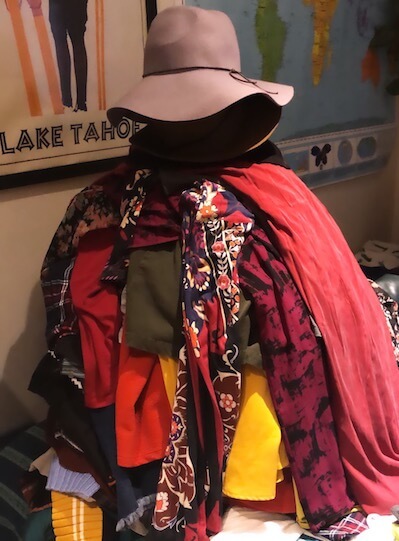 We asked Christina to write a blog post on the types of items that are cluttering our closet and making it a chore to get ready in the morning. This post was written by Christina Cortes. At the beginning of our session, Ashby described her closet as overwhelming. Here in New York City, this is common because everyone has small apartments and even smaller closets. Because there’s such a lack of space, it’s important to be thoughtful and intentional with the items to store in your closet so that your space can be functional and can look great. If you are located somewhere that isn’t as urban and densely populated, and you have enough space to walk into your closet (the dream of all New Yorkers! ), you will find the same issues, potentially even more prominently, as you may not need to be constantly making space. You’ll likely discover items you forgot about, clothing that no longer fits, and garments that you’re sick of wearing or that remind you of a negative time or person. What’s great about KonMari and the Joyspace method is that you’re looking for the items to keep, the pieces that you love, that make you feel good, the clothing that fits you, and the items you get complimented on every time you wear them. The rest you can let go of. Your wardrobe should bring you joy, especially if one of your closet resolutions is to wear what makes you happy. 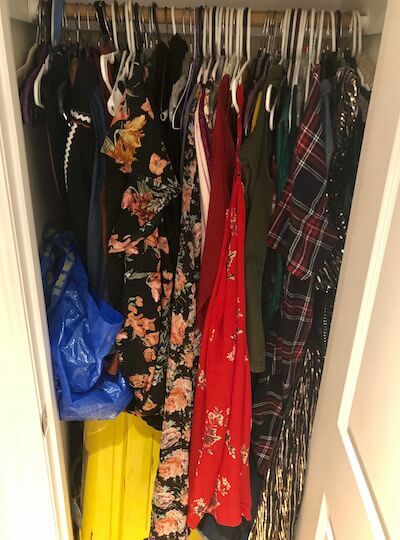 Here are a few things I discover time and time again in almost everyone’s closets—from the teeny tiny ones to the full sized walk-in ones. Is there a blazer that you got fired in that reminds you of that terrible day every time you see it? Were you wearing your favorite T-shirt when you got into a huge fight with your best friend and now you always think of that day when you grab it from your dresser? Or is there a dress you used to wear all the time when you were in a miserable relationship? We all have pieces like this. Even if these items fit you well and used to be your favorite or your go-to items, the fact that they now remind you of something negative means they no longer spark joy. It’s time to let them go. This doesn’t mean you should get rid of every item you wore in a bad relationship, but if on first glance of the item you think of the negative, then it shouldn’t get the honor of staying in your closet. Your closet should be filled with items that spark joy, items that make you feel incredible. If you had clothing that you hated before you started receiving Dia Boxes, like a pair of ugly jeans that you wore out of necessity but you now have Dia&Co jeans that you’re in love with, it’s time to let go of the denim that made you sad. You’re curating your closet to pick out the best of the best. Generally, if there is an item in your wardrobe that still has a tag, it was probably bought on sale or it was an impulse buy of a trendy item you wanted to try. In Ashby’s case, she has lots of items she got for free from work, like samples that still had a tag on it. Whatever the case may be for you, if the item still has tags on it, it isn’t truly your own yet. Perhaps when you see it, you feel guilty about the money you wasted on it. There is some reason why you haven’t worn it yet. If it’s because it’s a fancy item that you purchased for a special occasion that’s coming up on your calendar, it’s okay to keep. Simply remove the tags to make it yours. However, if you had the occasion to wear it and you still haven’t yet worn it, examine why. Is it just not your style, color, or cut? Do you not have the right undergarments to wear with it? Does it require purchasing items to wear with it, resulting in more work than you’d like to be able to wear it? Then it’s time to say goodbye. Since it still has the tags on it, you could even try reselling it to someone who would be really excited about it. Your closet is prime real estate—don’t let items that don’t serve you take up that precious space. Make sure you’re learning a lesson in exactly what items you truly love so you can make smarter decisions the next time you spend money on clothing. In Ashby’s case, she had a lot of items that still had tags because she took them home from work. Because she wasn’t spending money on these freebie items, she felt she had to take advantage of the opportunity for free clothing. But in reality, these were items she didn’t need or that weren’t really her style. Before you bring anything home, regardless of its price tag, take an extra minute to ask yourself, “Will I actually wear this?” Free clothing and super sales are hard to resist, but free closet space is even better! If your weight fluctuates, this one can be a bit tricky. People often keep items just in case they lose or gain weight. I always advise clients to focus on what fits right now. But if you know that you fluctuate, it doesn’t hurt to keep just a few of the good items that aren’t your size right now. Be very selective! You may remain exactly the same size you are now and these items would just take up some of that precious closet space. Look at these carefully. If you were to go up a size, would you be happy and comfortable wearing it? Or, would you prefer to treat yourself to something new? If you were to go down a size, would you feel good wearing the item? Would it become a staple? Make sure you’re not using your closet as storage for clothing that doesn’t fit you right now because that doesn’t serve you. Generally, these forgotten items are a good thing! That piece you love but got buried deep in your drawer or the dress you wore only once that got shoved to the back, it’s easy to forget about items that we can’t easily see. Ashby discovered a black velvety dress she forgot about because it was hidden on a hook under winter coats. Clearing out some of the other pieces that no longer serve a purpose can make room for these newly discovered items. Plus, you get the same thrill you would if you were to go shopping for something new! Now all Ashby needs is to put a turtleneck under her newly discovered black dress and rock it like it’s brand new! These are the items you keep because “you just never know.” Maybe you’ll find a reason to wear it. Let’s say you have a cardigan that would be good to have if you’re wearing a special occasion dress but it gets chilly that night. In my own closet, this is exactly what I did and I kept that cardigan for years. Then I realized I had been at many special occasions where it got chilly at night and I never once brought this cardigan. I either made do with something else or I suffered through the goosebumps. I obviously didn’t like something about the way this cardigan fit, because it was cute and still in good shape but it wasn’t serving me by sitting in my closet. There are some “maybe items” that would be wasteful to get rid of because you may have to buy it again soon, so be really thoughtful about these items. Maybe you’re keeping something for skiing but you haven’t hit the slopes in 4 years. You wouldn’t want to repurchase your ski pants but why haven’t you used them? Do they really still fit? Have you moved far from the mountains and don’t see yourself skiing in the future? If you do decide to keep it, make sure you treat it with all of the love that you would your other clothing because now you have purposefully chosen to have it live in your precious closet. These items are the exact opposite of the items that carry negative emotions. The sentimental items are the ones that make you smile and remind you of good memories. These are the items you can’t bear to part with. If it’s a sentimental item that you wear all the time, like a necklace you bought on a trip or a sweater that reminds you of home, it’s a keeper. But if there is something that is sentimental that you no longer wear, it can be a bit trickier. Maybe it lives in your closet because you like seeing it hanging up. Or maybe it goes into a box that you fill with other sentimental mementos like photographs. If you realize that you have too many items from college that are sentimental, just pick your very favorite. If you are the kind of person that loves to hang onto a free T-shirt from an event and you realize you have about 20, it might make sense to make a quilt out of your old tees so you can see them regularly. Make sure you’re being intentional about what you choose to keep. Even if you do have the space for it, don’t keep around anything that is just meh and doesn’t spark joy when you touch it. The end result is a closet full of items that you love wearing, that you’ve recently reminded yourself of, and that you can easily see. In Ashby’s case, her goals were to clear a dresser drawer for her boyfriend and get all of her sweaters in the same room. 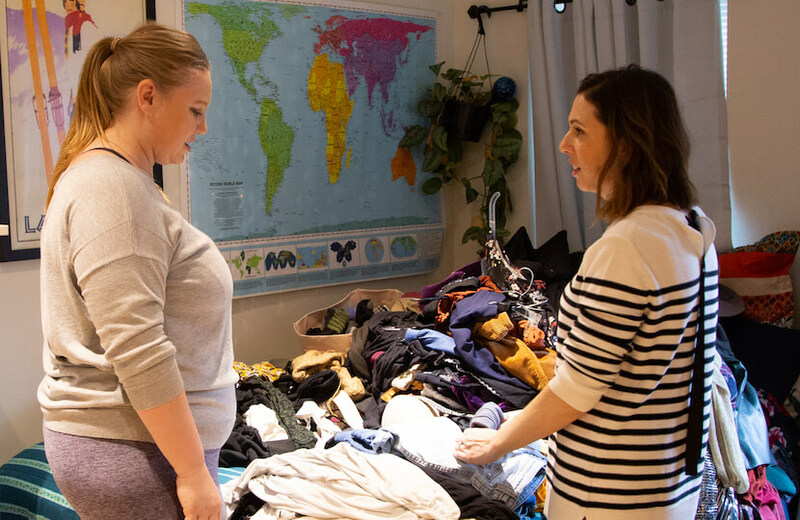 Now Ashby can easily see everything in her closet and dresser, her boyfriend Joe has his own drawer, and her sweaters all live in the same drawer, folded and organized neatly. If you’re looking to do the same, drawer dividers, cute bins, chalkboard labels, matching hangers, and wallpaper in back of the closet are all ways to make your space aesthetically pleasing. If you like looking in your closet, you’ll like getting dressed in the morning, and that will set the tone for your entire day. In your closet, hanging up an old poster you meant to frame or a whistle from the time you were a coach are ways to make your space feel special. You have to spend at least a little bit of time there every day so why not make it a happy place?